2013 Funko Big Bang Theory Mystery Minis are a line of blind pack vinyl figures. Covering the popular sitcom, all of the main characters in the show have at least one figure in the line. Sheldon has seven different variations. Each of the 2013 Funko Big Bang Theory Mystery Minis stands about 2.75" tall. 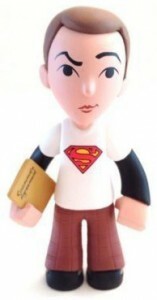 The vinyl figures take on a cartoon likeness of the character. They're done in a style that's similar to a lot of clay stop-motion productions of the past. Like the Funko's Walking Dead Mystery Minis, each comes in a sealed box. You don't know what figure you're getting until you open it. Adding to the collectibility are insertion ratios that make some figures rarer than others. Most land 1:24 packs. Short prints include Sheldon wearing a Batman shirt, which is 1:24 packs. The rarest figures have the four main characters inStar Trek costumes. Raj and Howard are 1:72 packs (1:3 cases) while Leonard and Sheldon are 1:144 packs. 2013 Funko Big Bang Theory Mystery Minis cases come with 24 sealed packs or boxes. The following is a break down of all the figures in the set as well as the odds in which they fall. I think i like the pop figurines better but those are really cute too ! And like the pop figurines, Amy and Bernadette are the best and once more Penny is a little bit too “simple”.